Apple never leaves its users unhappy. Be it their amazing series of iPhones, Mac computers, iPad, or the Apple Watch. The latest released Apple watchOS 4 is again an example of a fully loaded gadget. It does much more than showing you time. Managing your tasks, taking calls is a cake walk with Apple watchOS 4. Another nifty yet useful feature that comes with watchOS 4 is its ability to work as a flashlight. With it in hand, you do not have to worry anymore about getting hurt when there are no lights or looking for something that you have dropped by mistake in the night. 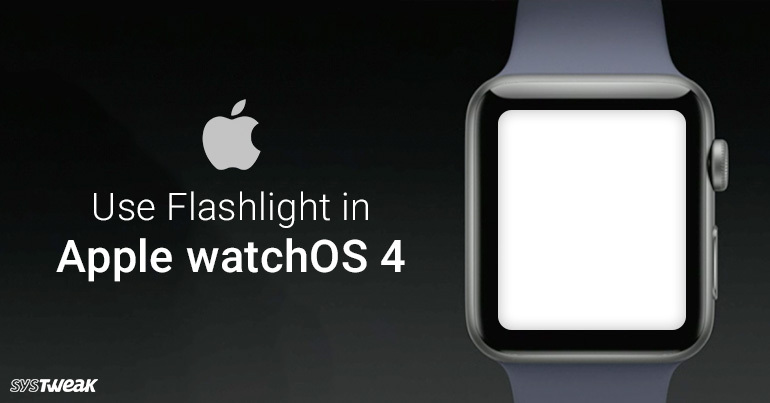 With watchOS 4 it is now possible to use your Apple Watch as a flashlight. A point worth noting is since Apple Watches does not have any LED Flash, Apple watchOS 4 makes use of the watch screen to display the light. Though unusual, but upon use seems really comfortable. Flashlight feature in Apple watch is present in the Control Center. So, without further ado, let’s see how to make your Apple watch works as a flash-light. As an initial step, raise your hand in order to activate the screen and then open the Control Center by swiping up from bottom of the screen. From the Control Center, you then need to look for the flashlight icon. Once located click on it. After you have done this, the entire Apple Watch screen start illuminating at the maximum brightness. Once you are done with your work, simply press the digital crown or swipe down the screen to switch of the flashlight. When the flashlight is turned on, swiping the screen to the left changes the mode. The mode displays the light that switches between white and black color. If the screen is swiped towards right, the flashlight mode changes again and the flashlight turns red. So, these were the simple steps following which you can turn your Apple Watch to a flashlight and make sure you do not lose anything or hurt yourself when in dark.